Once in a while I try at home one of those fragrant and tasty types of rice that one usually indulges in Indian restaurants along with tandoori chicken or barbecued ribs. 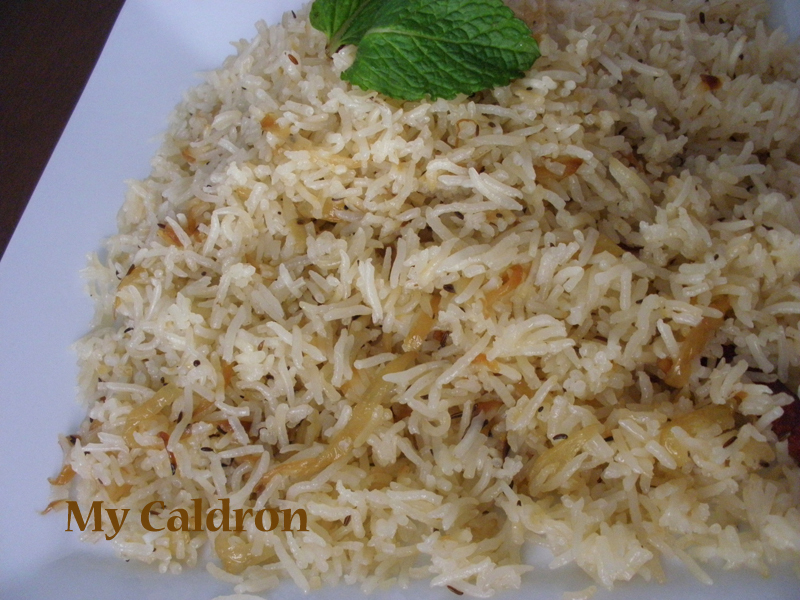 Of course I am used to preparing rice Iranian style, whether it is plain or mixed, which I maintain is unbeatable! Meanwhile, the kinds of spices found in Indian cuisine are rarely or never used in Persian rice and for that reason alone the taste and experience is quite exciting. 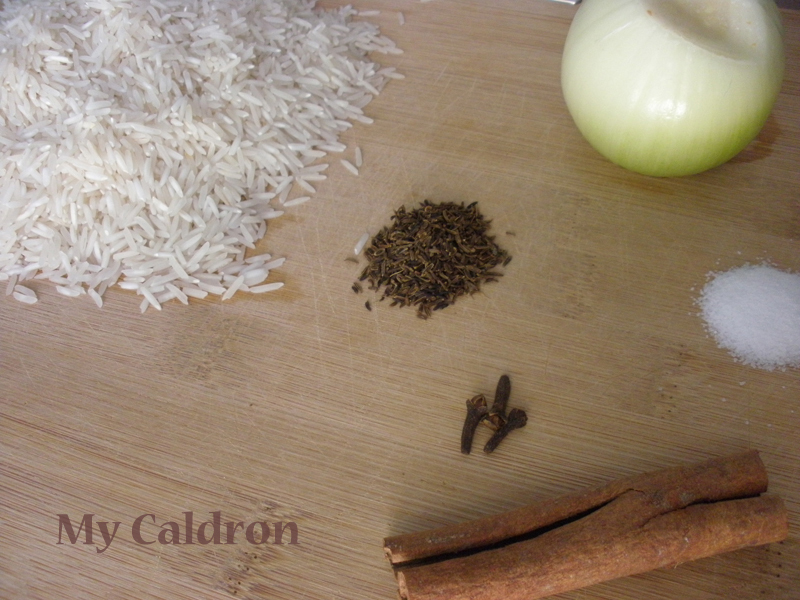 Here is my favorite Indian rice – with fried onions, clove, cumin & cinnamon. I initially came across this recipe in All recipes.com and modified it a little bit. Optional: 2 green cardamom pods, if you like its poignant taste. First off, wash the rice with lukewarm water by racking with your fingers rinsing twice. Then, soak with lukewarm water for 30-45 minutes. Heat the oil in a medium pot over medium heat. Add cinnamon stick, cumin seeds, and clove and sauté for a minute (cardamom too if used them). Add onion and fry for about ten minutes or until they turn dark gold. You should stir frequently to get a homogenous onion. This of course should be done when the rice is already soaked long enough. Drain rice and add it to the pot. Stir and mix everything for a couple of more minutes till the rice, too, is slightly fried. Add salt and water and mix well. Close the lid and bring to a boil. Immediately, turn the heat to minimum and continue cooking the rice until all water is absorbed. By now, the rice should be almost cooked at the core. Turn the heat off and let the pot stand for 5-10 minutes. Fluff with a fork before transferring into a serving platter. The spice-rich rice is slightly brownish and extremely scented and savoury, even as the main dish but probably with tandoori or roasted chicken.